Home 2017 January 31 How did Vikings have an Influence in Medieval Europe, and in the World Today? Vikings aren’t necessarily believed to be the most influential group to have roamed this Earth, and were more known for the sagas of their short-lived “empire”. Vikings were known for their brute force, and somewhat dull intellect/mercy. The more direct influence that they had was that thousands of people were killed in their wake, and their brutality led to a bit of a dark age. Many of the Europeans thought that their raids were the apocalypse, because they believed that God was going to punish them for their actions. They decimated communities, and even sacked kingdoms and large cities such as Paris. The more important of the contributions, is their expansion onto seafaring, military strategy, and navigational technologies. They were some of the first people to sail over the open ocean, and land in the spot that they intended to. 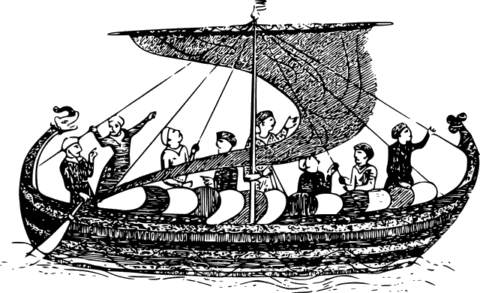 They also had coveted boats that could sail both up rivers, and over the ocean. How did Vikings have an Influence in Medieval Europe, and in the World Today? by Alex is licensed under a Creative Commons Attribution-ShareAlike 4.0 International License. I’ve never thought of the viking’s influence on the things you mentioned. It’s very interesting and there is a lot to be said about vikings as a whole. I think you picked an awesome topic to research. Eaters of the Dead by Michael Crichton is a more realistic version of the story Beowulf. Crichton does a really good job of giving an accurate portrayal of the viking way of life. It may help in your research but if not it’s a good read.